Godzilla + (Jaws + Anime) x Crazy = Profit? Sometimes a film's most basic setup can justify a curiosity viewing, regardless of the subjective quality of the overall production. Gyo: Tokyo Fish Attack is one such film. From opening to fin, this hour long anime is a work of such batshit (or should I say fishshit?) insanity that you can't help but be fascinated by it even when you know you shouldn't be. It's a film that taps deep into your sole and hypnotises you with sheer weirdness despite its gaping flaws. So yeah: I'm sure that synopsis is a relatively solid indicator that purchasing this DVD is a one way ticket to crazy town. 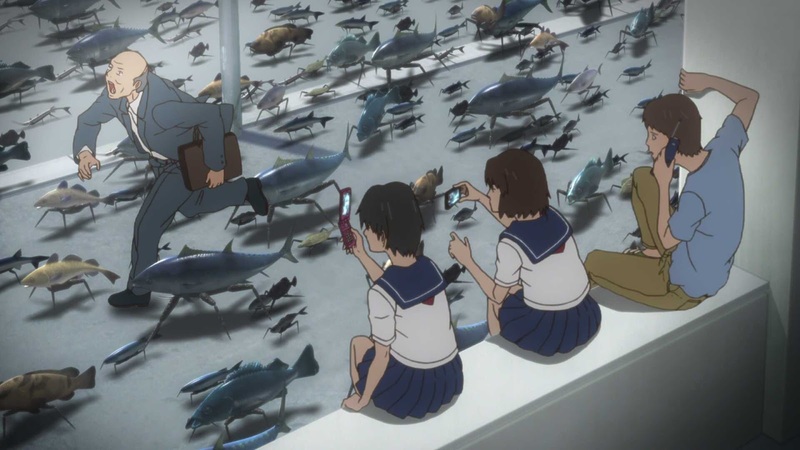 Scenes of massive schools of fish invading Japan are the order of the day, and nearly the whole film is seen through a fog known as the 'Death Stench' that is synonymous with the deep sea invaders. Mad scientists and government conspiracies are introduced to try and bring some coherence to the nonsensical story, but tongues are practically superglued to cheeks: if anything, this is an eccentric parody of the disaster movie, with lashings of cyberpunk surrealism thrown in for good measure. Amusingly, the main character Kaori's arc follows her overcoming her phobia of the smell of death: this is a very specific type of black comedy, both understated and straight up wacky, and oftentimes it hits its satirical mark. The animation is cheep and cheerful (its low budget is evident throughout), but sufficiently bizarre and comically grotesque. When the humans start turning a tad cyborgian... well that's a pleasant rectal surprise I'll allow you to discover for yourselves. Sometimes, it's uncertain if a few of the film's more floundering moments are purposefully silly and self-aware or just straight-up misjudged. Like much anime, it has an uncomfortably misogynistic streak, with several scenes of not strictly necessary disrobement. Invevitable really: in a film about mutant sea creatures, did you honestly think tentacles weren't going to make a cameo appearance? The story, meanwhile, embraces and subverts the cliches and tropes of disaster and monster movies. But is that any excuse for the massive holes, inconsistencies and oftentimes less than urgent pace? Again, much of this can be explained by the film's low production finances, but the film's narrative clock and calender are rarely convincing. These flaws may stick out like a tuna in freshwater, but Gyo's oddness, wicked sense of humour and parade of grotesqueries earn it a plaice perched on a proud collector's shelf of low-budget curios. It is a work that unfortunately falls back on some of anime's more regressive traits, and will leave many suitably baffled and bewildered. Tokyo Fish Attack is an inconsistent and inevitably fringe creation. You may not fall for it hook, line and sinker, but Gyo's unashamed eccentricities make this one mutant sea creature disaster film worth trawling.